Siri Krabi kohteessa Krabi, Thaimaa: Varaa nyt! 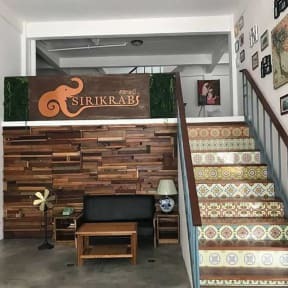 Siri Krabi is a hostel located in Krabi city center. It is located in the middle of walking street and near the main mini bus (song-taew) stop. The shuttle bus from Krabi Airport usually drops you in front of the hostel too. It is very convenient for everything. We have 10 rooms; 1 dorm room with 10 beds and 9 private rooms. 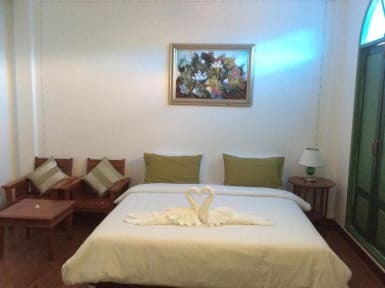 All rooms are equipped with air-con and private bathroom. If you want to visit Phi Phi Island or any other nearby attractions, just let us know. We can recommend you how to go and we sell bus, boat and ferry tickets as well. 5. No Smoking in the whole hostel. 6. Reception working hours 24 hrs. 7. You can rent motorcycle from us.